It’s been a while since we brought you any news on CND Shellac Soak-off Gel, but this time it is not about new shades. 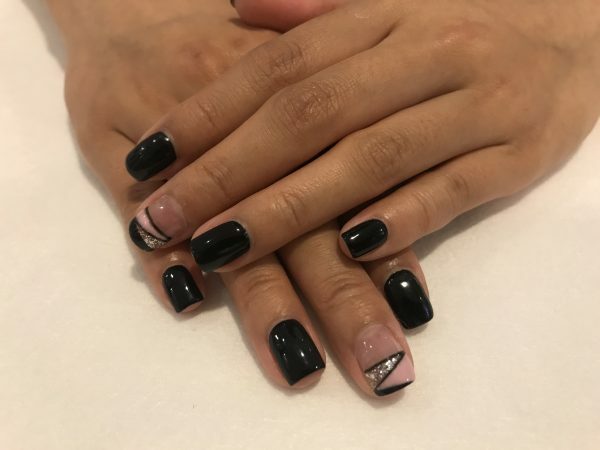 We are showing you techniques of geometrical nail art with two existing shades: CND Cake Pop and CND Black Pool. First, start by working some stripes with Black Pool. Then, use a nail art brush to fill up one of the shapes with Cake Pop. Clean the brush. Dip the brush with Top Coat and glitter to fill up another blank space. Come back with Black Pool on the remaining space. Finish this nail art by darkening the lines with some more Black Pool. Once you become good at this, you can create your own geometrical design as long as you are pleased to.